Our 2017 Fantasy First Basemen rankings were actually a lot tougher than we thought. At first, we thought Paul Goldschmidt was a lock to be the #1 first baseman, but his power took a dip while Joey Votto actually played a full season, and Freddie Freeman had a big bounceback year. And Edwin Encarnacion had another huge power year, and he's moving to Cleveland where the lineup is arguably more potent than the Blue Jays'. And then there's Miguel Cabrera who, hurt or not, always manages to put up big fantasy numbers. This doesn't even delve into the sleepers and up-and-comers, either. Check our fantasy first base rankings, below, and stay tuned before our fantasy draft as the free agent market continues to steer the conversation. 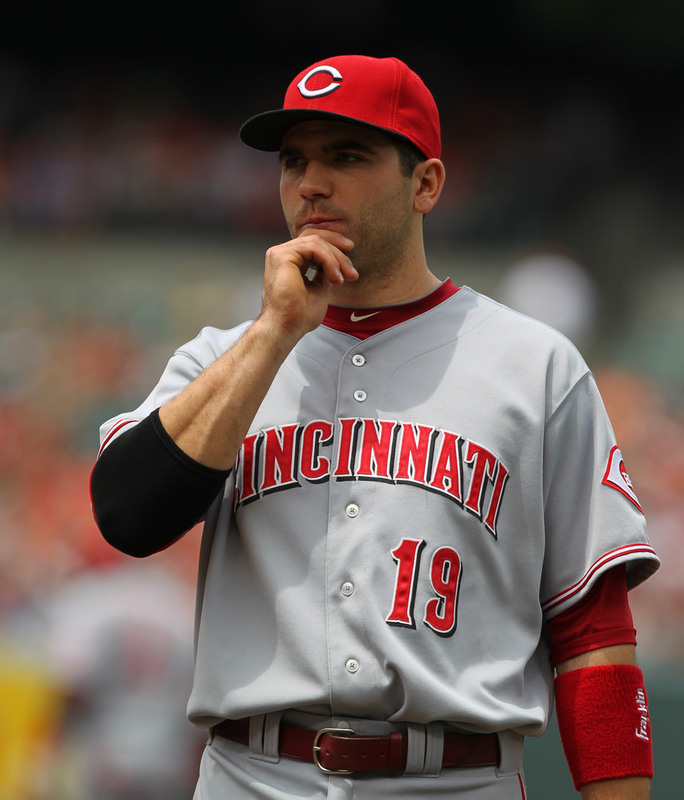 Joey Votto paid off big last season as he hit 29 HR in 158 games for the second straight year. He also led the NL in OB% at .434.
Who's the Best Fantasy First Baseman for the 2017 Season? Like we said, don't worry if you don't get Goldschmidt as your first baseman. In fact, our 2nd-ranked first baseman only had 2 stolen bases last season. Edwin Encarnacion is an absolute beast at the plate, and he's moving on to Cleveland. The Blue Jays' lineup was scary enough, but the Indians' lineup may be even more potent this year. We expect no significant drop-off in Encarnacion's stats, and consider it a win if he cracks 35 HR with 110 RBI and 90 Runs. Anything above that is gravy. Anthony Rizzo is our 3rd-ranked fantasy first baseman mainly because of his surroundings: Wrigley Field, the lineup around him, the pitching staff taking pressure off of the offense, and the fact that the Cubs are world champions (God... that's still really weird to say). If you look at his stats vs. Miguel Cabrera's, Cabrera outperformed Rizzo. We just see more upside to Rizzo, mainly due to age. But, really, that's it. Likewise, Miguel Cabrera's power output is all that put him ahead of Joey Votto. Votto is only about a year younger than Cabrera, but Miguel Cabrera's health has held up a little better over the years. Plus, 38 HR and 108 RBI for Cabrera vs. 29 HR and 97 RBI for Votto is a significant difference. Take that into account with the DH and the Tigers' lineup vs. the Reds' lineup and we still think there's a better shot that Miguel Cabrera will outperform Joey Votto in terms of fantasy numbers. Not by much, so this is mostly a toss-up, but Miggy's the safer fantasy bet. Wil Myers had 28 HR and 28 stolen bases last season. He also scored 99 runs while driving 94 RBI. So why isn't he 2nd behind Goldschmidt? Because he only hit .259 - a big gap from Goldy's .297, let alone Votto, Cabrera and Freeman who are all over .300. Also, Myers came off of two horrendously-disappointing seasons in '14 and '15, so we're not buying his act after just one awesome season. However, he's entering his prime at age 26 and he's coming off of a great season. The big problem is that he strikes out a ton which is an indicator of being too streaky, but if you put him in your lineup and forget about him, you'll end up with 25+ HR, 20+ SB and 85+ runs and RBI. Worth a shot, maybe even over Freeman, Pujols and Votto if it all works out. Freddie Freeman plays on a crappy team and has been there for a few years. last year, however, he still managed to hit .302 with 34 HR, 91 RBI while scoring 102 runs. Freeman is also 27 years old right now which is the middle of a player's prime. And to be fair to the Braves, they're going to be better this year, even with flashes of excitement, and they're playing in a new stadium which also gives a team a little boost offensively (well, almost always). Look for Freeman to emerge as the no-questions-asked leader of this team this year while hitting 28-35 HR with 100 runs scored and 85-105 RBI. We'll keep this pithy: Pujols is old and is prone to injury. Also, his paltry (for him) 71 runs scored will have a negative effect on your team's stats, especially when you decide to leave him in for his power. Carlos Santana is probably to most-reliable one of the bunch, so if you're concerned with someone's stats remaining consistent, he's your guy... Eric Hosmer, on the other hand, we aren't quite sure. He set a career high in HR and RBI last season, but we don't know if he has the power in his bat to get him to the 30 HR mark. 25 is fine, but he also added 24 more strikeouts, 4 fewer walks and 9 fewer doubles in the same number of games and plate appearances from '16 over '15. Maybe some of those doubles turned into HRs, or maybe they turned into those strikeouts when swinging for the fences instead of for contact. We shall see, but we don't trust him quite yet... And then Jose Abreu: the only thing keeping him down from the top 10 is the crappy team around him. 25 HR, 100 RBI and a .295 average should get him more than 67 runs scored, but there's still more upside to Abreu than Pujols and Hosmer, we think. Really, these four guys can be shuffled in your draft any way you like, depending on how the rest of your draft goes. Email us and let us know your rankings!